James Francis George James-Crook (Jimmy) was born on the 19 July 1926 at Brondesbury Park, London NW6 the only son of James James-Crook who was an Honorary Court Assistant in the Bowyers' Company. He was educated at Northcliffe House School Bognor Regis where he was head boy and then at Aldenham School, at Elstree in Hertfordshire where he was in Preposter House. From 1944 to 1947 he served in the 3rd King's Own Hussars, part of the 6th Airborne Division in Palestine. On leaving the Army he joined Thomas Ebbutt and Sons, Funeral Directors of Croydon. On completion of training in 1950 he joined the family business in Kilburn (founded 1801). In 1954 he became Director of CJ Jordan & Son Ltd, Monumental Masons of Acton. In 1954 he married Phyllis Margaret Neal of Hove, Sussex and they had three children James, Neal and Denise. His father, a fifth generation undertaker, was a member of the Company for many years but did not take on the Mastership as he was 50ish he claimed to be too old for the post. Jimmy was admitted to the Livery in October 1955 he was sponsored by a Mr Edwards, a long standing member of the Company. 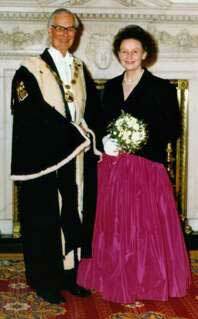 Having served as both Renter and Upper Warden he became Master in 1994. During which the Company visited the Battlefields of Agincourt, Poitiers and Crecy. His Jubilee was recognised with a presentation at the Agincourt Dinner in 2005. He is a holder of a diploma in Funeral Directing and a qualified embalmer. He was a members of the Willesden Young Conservatives Cs, the Willesden Round Table, the Willesden East Rotary Club and Member of eh Willesden Chamber of Commerce. He was also a Commissioner for Taxes in1952 and on the advisory panel of the Post Office NW London in 1953. His other interests include being a member of the Pulborough Society, a sidesman of St Peters Church Parham, a member of the Pulborough Branch of the Conservative Party. His hobbies include vegetable gardening, art and the study of country life. Memories of the James-Crook Family Jimmy James Crook (Master 1994-96) writes that his father, a fifth generation undertaker, was a member of the Company for many years but did not take on the Mastership as he was 50ish he claimed to be too old for the post. 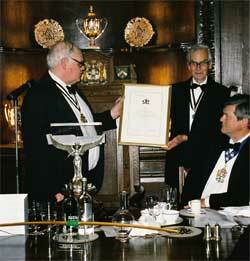 He was admitted to the Livery in October 1955 and became Master in 1994. 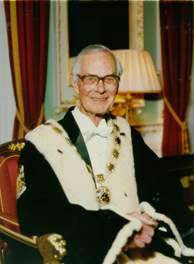 His Jubilee was recognised with a presentation at the Agincourt Dinner in 2005. His son also James was admitted to the Livery in October 1991. Phyllis, Jimmy's wife, wrote a few comments about Jimmy's father. She does not know exactly when he became a member of the Company but it was some time before they were married in 1952 and she remembered that Tony Read was the Clerk. A Mr Edwards, a long standing member of the Company proposed his membership. Her father in law took an enormous interest in the Company and supported it to the best of his ability. He always felt it to be a privilege to be a member and as well as being honoured to rise to the Court, at the same time he felt humbled. Later he told her that he would not go forward to be Master - he said he was too old. She was bitterly disappointed for in her opinion he would have been second to none. However he paved the way for Jimmy who was fortunate enough to know Mr Archibald - a delightful man - gentleman - whose sister filled the role of the Master's Lady so graciously. His banquet was held at Fishmongers' Hall. She greeted me and immediately took me to see the portrait of the Queen Mother with the Queen and Princess Margaret. Sir Rupert Neville comes to mind and Sir Ralph Anstruther (Treasurer to the Queen Mother). She met his mother because she left her tiny pink leather gloves in the cloakroom! Of all the Banquets I have attended I enjoyed that evening the most. I was seated next to Sir Ralph - such an interesting and down to earth man. She loved all the old traditions - long may it last to-gether together with the support of the Company for the disabled. - their incredible mastery at Burnham and Harrow for the Silver Arrow is quite amazing. Jimmy was proposed by Anthony Wood - who moved to the West Country. During his time as Master, the Company made a visit to battlefields of Agincourt, Poitiers and Crecy.